The Turkish Gate (Rumi Darwaza), Lucknow. bl.uk > Online Gallery Home	> Online exhibitions	> Asia, Pacific and Africa Collections	> The Turkish Gate (Rumi Darwaza), Lucknow. The Rumi Darwaza served as the entrance to the city of Lucknow; it is 60 feet high and was built by Nawab Asafuddaula (r. 1775-1797) in 1784. It is also known as the Turkish Gateway, as it was erroneously thought to be identical to the gateway at Constantinople. 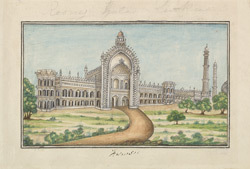 It is the west entrance to the Great Imambara and is embellished with lavish decorations.